ACE Nursing presents to all nursing cohorts every year, providing key information about the ACE application process. Should students not be able to attend this presentation we recommend reviewing the Student Presentation slides which can be downloaded in the Resources Section of our website. 2019 presentation dates can also be found in the Resources Section. 1. Register Profile: Create a profile for ACE Nursing which includes your username, password, email address and contact information. ACE will generate a unique identification number for each applicant. Applicants re-applying to ACE only need to log in with their user details. 2. Begin Application: Once your profile has been created, applicants can begin completing the various aspects of the ACE Nursing application. A detailed overview of the requirements for ACE can be found here. 3. Select Employer Preferences and Practice Settings: Each applicant will be asked to select and rank up to three employers or preference and up to five practice settings. Full details about individual employers can be found in the Vacancy and Position Information section. 4. Progress the ACE Nursing Application: The application process for ACE relies on the candidate completing every section of their application. Each section will be marked green once the system recognises that section as completed. For the Mid-Year 2019 intake applicants have four weeks from 10th April 2019 until 7th May 2019 to complete their ACE Nursing application. 4. Complete the ACE Nursing Application: Applicants must ensure ALL sections are complete and that their checklist reads complete prior to applications closing. 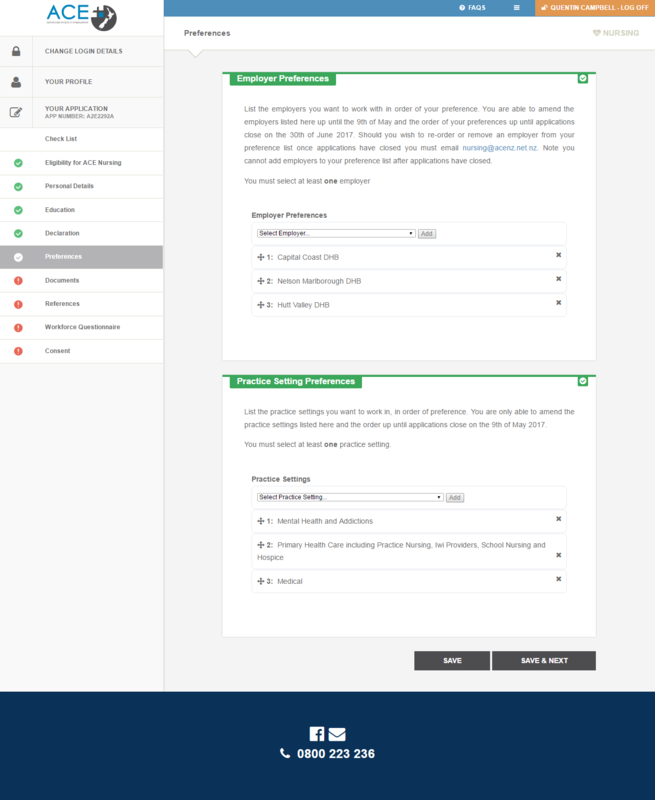 To check this, applicants can navigate to the checklist section of their application where their application status (complete or incomplete) will be clearly displayed. User Note: Each section has a 'save' button at the bottom of the page. You can save your progress and complete your application at anytime during the application intake. There is no submit button! Any re-applicant who still meets the Eligibility Criteria must login to the ACE Nursing website with their existing user name and password and re-apply. One month prior to each intake ACE will send an email to all eligible applicants who have not yet been employed, inviting them to apply. ACE will transfer your personal details and documents when you re-apply. Re-applicants must complete the rest of the application. Previous referee details will be retained. Applicants must contact ACE on 0800 223 236 to change referee details. A new reference request with unique ID will be sent to the referee outlining the next steps and the reference due date. Your academic transcript and identification documents will be uploaded to your new application. If there are additions to your academic results since you last application, you must upload this as a new transcript. To check the eligibility criteria and the full ACE Nursing process further, please download the 2019 Applicant Guide in the ACE Resources section. Employers have 6 weeks to shortlist, interview and rank their graduates. Each employer is responsible for this process and each employer may perform this process slightly differently. ACE Nursing are not involved with interviews and selections. Any queries relating to interviews should be directed to your NETP and NESP coordinators. 1. Employer Interviews: Employers interview graduates. Note that each employer runs their own process and interviews may therefore occur at any time throughout the 6 week period. 2. Applicants Update Employer Preferences: Applicants may wish to change the order in which they have preferenced their employers based on their interview progress. Applicants have until 9am, Monday 1st July 2019 to update their employer preferences for the Mid-Year intake and 9am, 4th November 2019 for the End of Year intake. Applicants must email ACE nursing@acenz.net.nz to request the change. 3. Employers Shortlist Candidates: Once interviews are completed, employers shortlist their preferred candidates and rank each candidate in order of preference. 4. Employers Submit Candidate Rankings to ACE: At the end of the 6 week interview period, employers submit to ACE their final ranked list of candidates as-well as confirming the number of NETP and NESP positions that they have. Employers will use the contact information you provide in your ACE application to contact you for these interviews. You can update your profile, including your contact details, even when applications have closed by logging into your profile. When interviewing it is a good idea to discuss with the employer their available vacancies and ask about the support offered for new Graduate Nurses in their organisation, that way applicants can make a more informed decision regarding how best to order their preferred employers. Employers may manage their interview schedules differently during this period. As such, some applicants may be contacted very early in the 6 week process while others may not be contacted until later during the process. Employers may interview differently. Some may hold panel interviews and others may hold one-on-one interviews while larger employers may choose to run an assessment centre to consider all of their applicants. Once employers have submitted their list of preferred NETP and NESP candidates and the number of positions they wish to recruit to, the ACE system conducts an electronic match process, using an algorithm matching candidates ranked by employers to any one one of the candidate’s most preferred employers. The employer ranking of applicants takes highest priority. This way, the employer’s highest ranked applicants have the best chance of being matched to a position. The applicant’s employer preference takes second priority. This way, if an employer prefers an applicant, the algorithm favours the applicant’s choice of employer from 1st to 2nd to 3rd. The algorithm will only match applicants that an employer has ranked for NESP positions to NESP positions and applicants ranked for NETP positions to NETP positions. This way, only applicants that the employers preferred for NESP can be matched to NESP positions. Please note applicants who rank Mental Health and Addictions as their 1st choice practice setting have the best chance of being considered for NESP positions. Each applicant can only be matched to 1 employer. Once the match is complete, the match results are then sent to the individual employers who will organise job offers and subsequently move forward with their own on-boarding and induction. Those applicants who were not matched will automatically go into the national talent pool. On the Wednesday after state final (see 2019 Intake Dates for specific dates) all candidates will be notified by ACE of the outcome of their application. On the afternoon of the same day, candidates who have been successfully matched will receive an offer directly from the employer they were matched to. Sucessful candidates must notify the employers that they have been matched to (not ACE) to either accept or decline their offer by Wednesday 5pm 24th July 2019 (Mid-Year) and Wednesday 5pm 27th November 2019 (End of Year). Failure to do so will mean that your offer will be declined and you will be removed from the entire intake. Applicants who were not matched will be emailed by ACE Nursing and communicate the next stage of the process. Their application will be included in the ACE Nursing Talent Pool. This Talent Pool is then distributed to all employers, even those that the candidate did not initially apply to. For more information regarding the Talent Pool process, please see the ACE Nursing Talent Pool section.